Speculatively, I'm very interested to comprehend why no one thinks they would be infected and they'll live to survive and fight off the zombies. This question appears to me to be utterly unsubstantiated. Someone has to be patient zero in order for the virus to spread and consequentially become pandemic. The most viable answer is that it would spread, fairly quickly depending on the type of virus it will be. Its preposterous to think that if everyone assumes they won't be the one to get infected, then there wouldn't/ couldn't be any zombies, correct? No zombies, no ZA. But we know there will indeed be a ZA (right? c'mon save me someone!) so someone has to get infected. It will start with at least one person; patient zero. Which brings us to the next hypothesis (mine at least.) If this is a blood borne virus, you'll still have a patient zero. Repeating what I said previously, it has to start somewhere, then spread. Now we have another problem, the question of who will that patient zero be? I'm guessing someone in the medical field, messing with blood samples will stumble upon something accidentally. Perhaps not even a medical professional but a health-care worker not disposing of hazardous medical waste properly. Most medical testing facilities do have at the very least some security, and I'm sure the government super secret ones have mega-security so you would hope that could contain the virus. Right? Right? But if one infected person gets out, we're screwed. We also have the problem of someone not realising they're infected, going home, out in public and spreading it unknowingly. (See the film "Contagion" for a good idea of how this could absolutely happen. Again, why do I watch these things?) So there you have your patient zero, which could indeed be YOU! There is hope. I also believe that once we've gone through the initial outbreak, we will have learned what a zombie looks like, how to deal with them, and things will start to go back to normal after a few weeks. One important thing to note is that firearms will be abundant. This is good and bad. Good as you'll have protection from becoming a brain-eating zombie, but bad if you mistake a regular person as a zombie and kill unnecessarily. I do believe -- with sadness -- that since there are so many firearms in NY, most everyone will be armed. A precaution would be to at least learn by going to a legitimate shooting range and becoming familiar with firearms since you may very well have to use one (even in the event of any disaster.) I don't believe in having guns. I think the only reason to have a gun is to use it. But my thinking is changing due to the unpredictability of humans as evidenced in previous disasters. Who knows, I may just decide to be one of those people training in the use of firearms; best to be safe than sorry... I suppose. My family is first and should I need to protect them I will, in whatever way I can. (Note to self: learn martial art... one that doesn't break old bones.) Not sure I'm at that point, though I can legally own a gun I'm terrified of one in the house especially with a teen, and more importantly afraid a friend of hers may get it in their head to "play", so a locked gun cabinet is a must, and something I suggest for anyone owning a firearm. (I grew up knowing exactly where my fathers rifles were -- still are for all I know -- unlocked I might add, and was thankfully terrified of them; will not allow my kid to grow knowing those things.) I suggest that for anyone considering this, its not an option -- a necessity; why tempt fate? Too many gun related deaths for no reason, and I refuse to contribute to that statistic. ZA aside, it actually does make sense to prepare a disaster plan. There have been plenty of disasters where people panic and its bedlam. As mentioned above I legitimately do believe in most disaster situations it will be people you really have to be on tenterhooks about. Having a disaster plan helps to keep you calm, know what you need to do, where you need to go, how to get in touch with loved ones, etc., all in the face of something I hope we never have to face in our or our children's lives. To make this a fashion/ lifestyle/ vintage post I'd like to leave you with the latest in Zombie Survival Chic. Please, if you're sensitive about wearing animal based product, cut to the end. For survival chic, think leather. Leather jackets, and trousers. Sturdy leather work boots, engineer or motorcycle boots, steel toes. 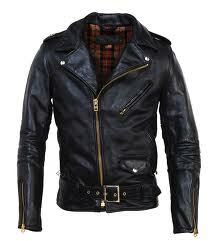 Leather is hard to ruin, a main reason that its used by motorcyclists. It will survive road rash with minimal damage. Of course leather in the heat isn't going to be very comfortable, but you can find lightweight leather as an alternative. The main thing is to keep yourself covered in some way so it would be harder for a zombie to get at you and infect you. Invest in a Schott Perfecto now, not only look great but it gets better with age and never goes out of style! Denim is another hard worker (not fashion denim you need the old fashioned workhorses like Levi's) and the jackets are pretty indestructible, difficult to rip and keep you safe. Mainly when it comes to clothing, chic really has to go out the window and utility is most important. No reason army-navy supply shops can't provide you with clothing you can make your own with the addition of accessories. Just make sure they aren't accessories that can't be easily grabbed (like long hanging scarves.) I can think of one good accessory that is both chic and utilitarian: heavy rings. You could slash pretty good with a nice heavy ring, and at least it would buy you some time while still being able to show your individuality with your chic look. Don't forget those bullet belts! Very chic either as a belt or slung like a cross body bag. Of course also handy dandy when filled with ammo. There is also something to be said for layering. If a zombie has you by a jacket, just take it off! With so many things to consider during the coming ZA, I seriously doubt you're going to be thinking about how chic you look. I know I'll be too worried about protecting myself and family from getting eaten! Now go on the "Virtual Blogger Walk" and see what others have to say about zombies! Just "walk" through each link below. I'm with you, I wouldn't take any chances either. Family is safe, all else...fair game! ;) Fun post! Even in the event of a natural disaster I'd be the same. Humans are too unpredictable! You're spot on with your assesment that a heightened fashion eye is important during a ZA. Just look to all our filmic evidence as support. Survivors are always wearing tailored, good looking threads. Dress everyday as though its your last, don't go out in sweats. Nooo sweats for me! Although I'll have to forgo my amazing shoe collection, boo! But then I do get to start some "zombie chic" trends, hahaha! Haha, I love the first picture. It is so true.... nice post. Yeah and I don't plan on being dinner! Thanks! I'd be ready if I didn't keep thinking of other scenarios and more things to deal with! I'm actually in the process of reading your story right now! It's a great point. We all think we'll be hunting others. Well, it's true. Thing is. Will we be hunting for zombies or brains. Great point, I never thought of it that way! Thanks for stopping by and have fun on the walk! Thanks for stopping by my blog too! Great post here. I have to wonder though, with your husband so obsessed with ZA survival, I wonder how he'd fare in my book? Interesting point. I was going to tell him about it anyway, so I guess we'll see! 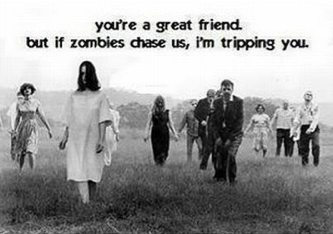 Have fun zombie walking and thanks for stopping by!